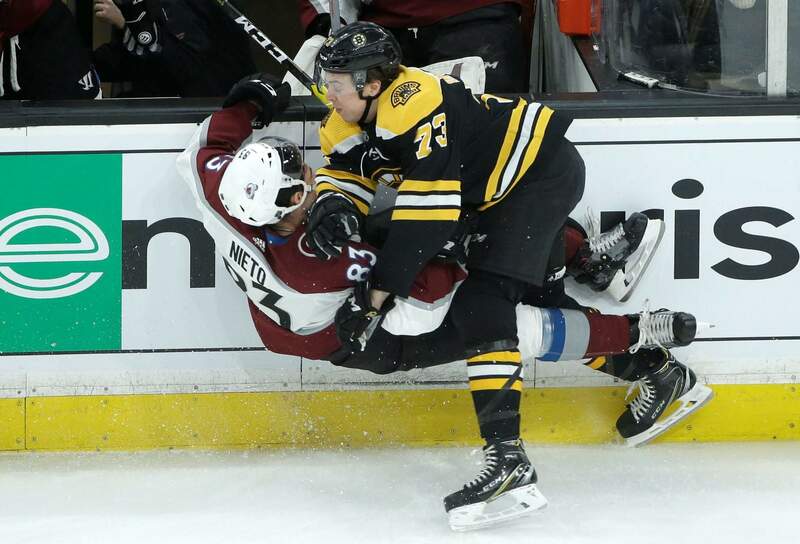 Colorado Avalanche’s Matt Nieto and Boston Bruins’ Charlie McAvoy collide sending them both to the ice during the second period of Sunday’s game in Boston. Boston Bruins’s David Pastrnak and Colorado Avalanche’s J.T. Compher skate past the puck during the first period of Sunday’s game in Boston. 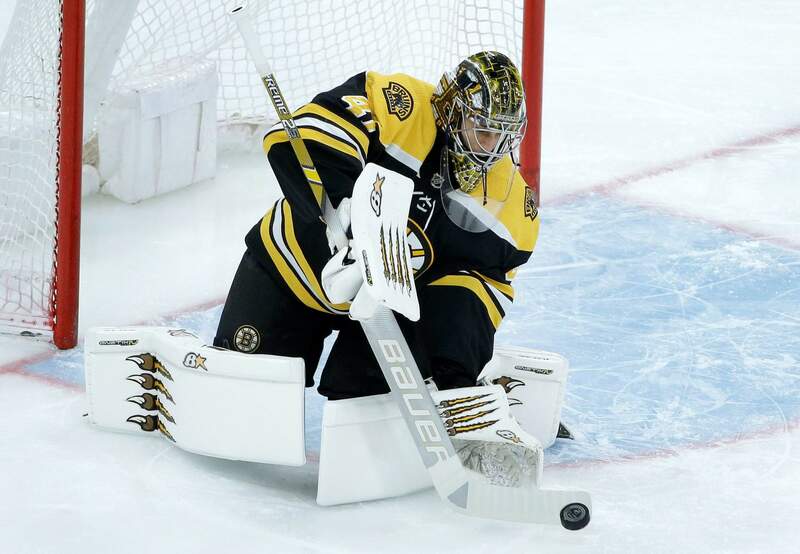 Boston Bruins’ Jaroslav Halak deflects an attempt on goal during the first period of Sunday’s game against the Colorado Avalanche in Boston. BOSTON – Brad Marchand has a knack for the net in overtime. A lucky bounce helped him get another winner for the Bruins on Sunday. Nathan MacKinnon scored his 29th goal for Colorado, tying Gabriel Landeskog for the team lead. Varlamov had 33 saves as the Avs lost their seventh in a row (0-3-3) but earned a point with a third consecutive overtime loss. NOTES: Boston improved to 8-1-2 in the second of back-to-back games this season. Colorado dropped to 3-3-2. ... 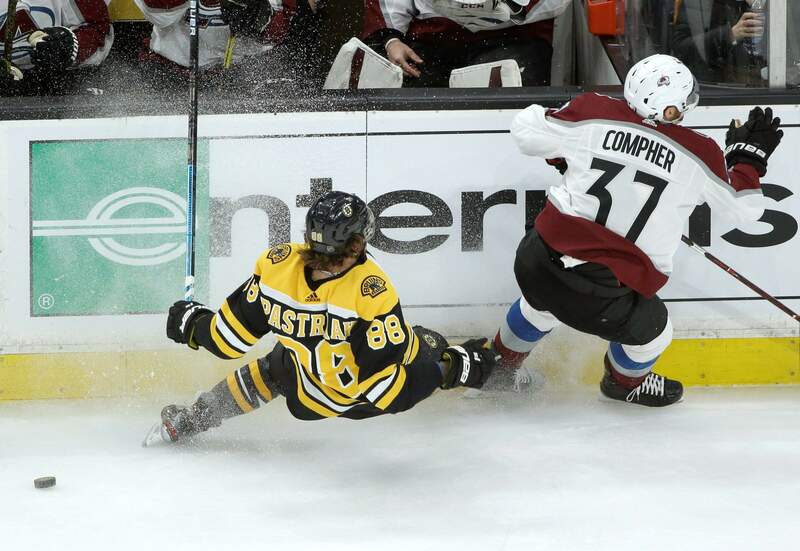 The Avs had won four consecutive games against the Bruins and were 12-2-1 in their previous 15 games in Boston. ... Bruins RW David Pastrnak’s seven-game points streak (four goals, seven assists) was snapped. ... Avalanche D Ian Cole (upper body) was sidelined a second consecutive game after his hit on Washington’s Evgeny Kuznetsov on Thursday evoked a bloody fight with Capitals RW Tom Wilson. ... Boston D Matt Grzelcyk (lower body) was out for a second consecutive game but will skate Monday and could return Tuesday against Chicago. ... Colorado D Mark Barberio (head) missed his sixth game in a row and C Vladislav Kamenev (shoulder) his 25th. ... Bruins D Steven Kampfer re-joined Providence of the AHL on a conditional loan before the game. UP NEXTAvalanche: Host Maple Leafs on Tuesday night.